Why are R195 a great offer for your octopus? Classic downstream valve for safe and reliable performance due to robust design and low maintenance. 1 metre hose for convenient alternate air soruce function with yellow hose protector and yellow regulator cover for easy identification. Left & right hose attachments for extra flexibility and cofortable positioning, so you can keep it on whatever side feels best. Compact size and lightweight materials for comfort and reduced drag during the dive. Orthodontic silicone mouthpiece in smaller size for perfect fit, no gum irritation and less jaw fatigue. Our R195 has fixed VIVA for safe and uncomplicated use. 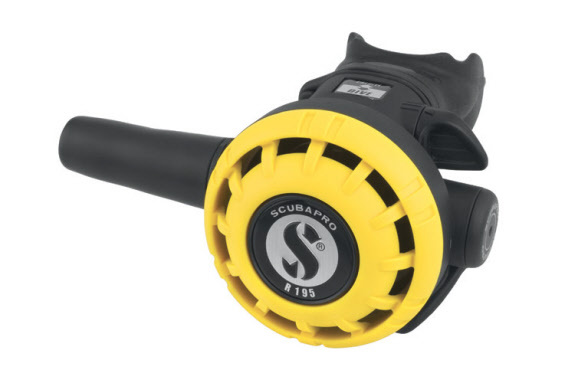 The R395 has diver adjustable VIVA for personalized breathing comfort. the downstream valve opens in the same direction as the incoming air flow. To close the valve and stop the air flow, a spring counteracts the force of the incoming air. Therefore, a certain inhalation effort is always required to overcome the spring tension and open the valve. Fixed VIVA (Venturi Initiated Vacuum Assist) flow vane. Fixed in the pre-tuned ideal position for safe and uncomplicated use. VIVA is another SCUBAPRO patented feature, the VIVA is available on all SCUBAPRO second stages. VIVA uses the power of a vacuum assist to reduce work of breathing and increase breathing comfort. It is diver adjustable on all current SCUBAPRO second stages except the R295, since it is a second stage intentionally designed for diver training courses, rental facilities and divers demanding ready to use equipment. A VIVA in MAX position gives powerful breathing support on every single breath; a VIVA in MIN position helps to prevent free fl ow on the surface, for training, for buddy breathing, in currents or when used as an octopus. Extremely lightweight and compact. Comfortable for all divers, including junior divers newly initiated in the sport. Orthodontic mouthpiece. SCUBAPRO uses a comfortable orthodontic mouthpiece on every second stage to reduce jaw fatigue and gum irritation. It was developed by dentists and dental laboratories and lasts longer than any other mouthpiece, because only a minimum effort is needed to hold it comfortably in place. Left & right hose attachments for extra flexibility and cofortable positioning, so you can keep it on whatever side feels best. Supplied as standard with right hand hose attachment. Left hand conversion must be performed by an Authorised SCUBAPRO service technician. The R295 Octopus matches all SCUBAPRO first stages.